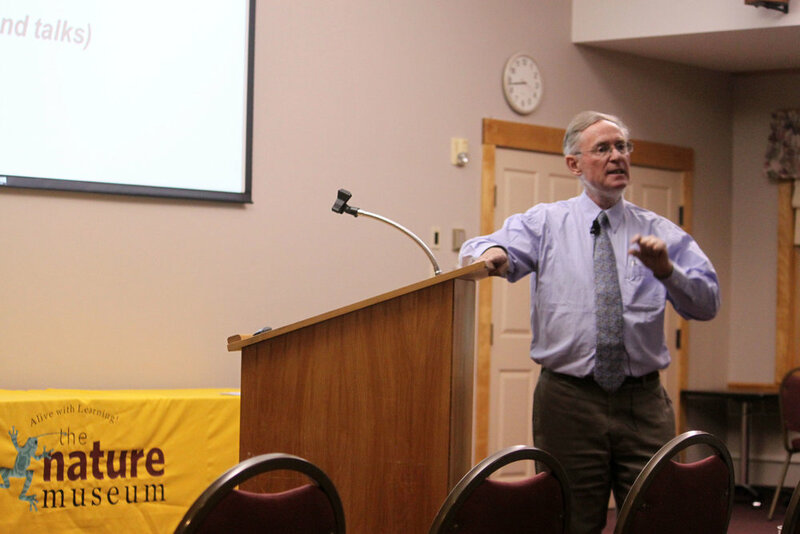 Dr. Alan K. Betts was on hand at Chester's NewsBank Conference Center on Wednesday night as part of our adult speaker series. A well-known atmospheric scientist, Betts explained how global climate change is ushering in more extreme weather and shorter winters to New England. Scientists have predicted that by the end of this century the weather in Vermont will resemble the climate that is now in northern Georgia. He stressed that there are actions we can take now to make a difference, including conserving the natural resources we have. He emphasized that significant strides have been made over the last 10 years to increase the energy efficiency of appliances, cars, heating systems, and lighting for our homes. Earth’s dwindling supply of non-renewable resources—along with the harmful gases they produce—makes conservation so important. Betts went on to describe how the consumption of fossil fuels has steadily increased since last century and has contributed much to the degradation of our environment. Climate change, global warming, extinction of several endangered species, depletion of the ozone layer, increase in air pollution are just a few of the effects from which our environment is suffering. Many European countries have taken steps to move toward clean and green energy sources like solar energy, wind energy and geothermal energy to save energy and leave fossil fuels behind. We want to send a big thank you to Alan for sharing his passion for the environment and science; and we are grateful of course to the community of folks who came out to learn from him! We welcome The Bird Diva, Bridget Butler on Thursday, April 27th. Tickets are available now! Did you attend Dr. Betts talk? Please take a moment to give us your feedback!